Home » purchase » Samsung » Secret Recipe » Secret Recipe Riang Raya Contest: Wins Samsung 55” LED TV, home–theatre system or a home- air purifier! 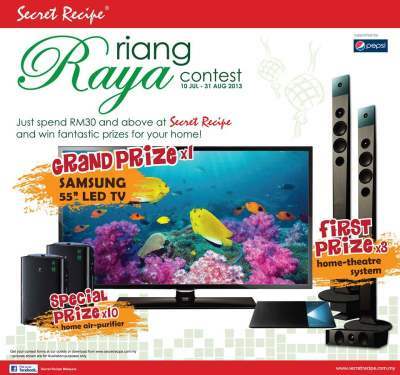 Secret Recipe Riang Raya Contest: Wins Samsung 55” LED TV, home–theatre system or a home- air purifier! Visit Secret Recipe Riang Raya contest page for more details.